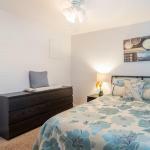 Located 13 km from San Jose StartUp Fever offers accommodation in Sunnyvale. The holiday home is fitted with air conditioning and free WiFi. Free private parking is available on site. The kitchen has a dishwasher an oven and a microwave as well as a coffee machine. Santa Cruz is 47 km from StartUp Fever while Half Moon Bay is 37 km away. The nearest airport is Mineta San Jose International Airport 9 km from StartUp Fever.